For the pro & amateur alike. 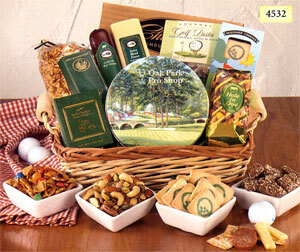 Delight in freshly roasted Deluxe Mixed Nuts and Pistachios in the Golf Theme tin, Hole-in-One snack mix, golf pasta, golf designer cookies, caramel popcorn, plus cheese, sausage, and crackers. Top off the feast with 6 oz. of delicious homemade English Butter Toffee and 2 oz. of Dark Chocolate Mint Delights. Golf tin is also sold separately; see Crock Gifts. Shipping weight: 6 lbs. Measures 13 1/2” x 12” x 5 1/2”. Case pack: 1. Prices shown per piece. Engraving area: 4” diameter. Make your first impression the best. This oval rattan and wire basket will make a great impression when given to clients, coworkers, or friends. You’ll find spread able cheeses (a spreader is included! 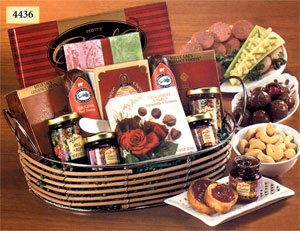 ), sausages, chocolates, preserves, and cashews. Shipping weight: 5 lbs. Measures 12 7/8” x 9” x 7 ½”. Case pack: 2. Prices shown per piece. 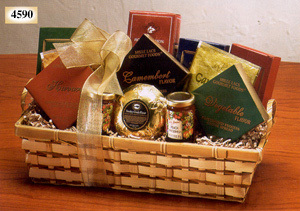 This hand woven basket includes cheese spreads, goudas, jams, coffee and tea, crackers, and chocolates, and is decorated with a gold ribbon and bow. Shipping weight: 5 lbs. Measures 15” x 9” x 8”. Case pack: 6. Prices shown per piece. 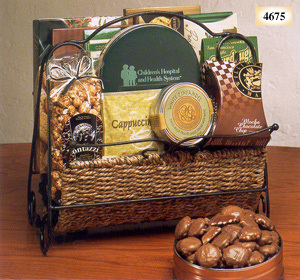 This sea grass and wire folding magazine rack is packed with a variety of our homemade chocolates, cappuccino, cocoa, cookies, Pacific salmon, crackers, White Zinfandel cheese spread, and even crunchy caramel popcorn. Laser engrave the forest green tin to personalize this creative gift. Shipping weight: 9 lbs. Measures 14 5/8” x 10 ¾” x 15”. Engraving area: 4” diameter. Case pack: 1. Prices shown per piece.